United Plastic Products Company produces high tear resistant and puncture resistant mono-layer films and laminated plastic bags for packing, protecting and preserving detergent products. Combining technical know-how and consistent quality machine technology, United Plastic Products Company (UPPC) meets detergent manufacturer packaging needs. 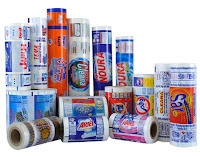 The polyethylene (PE)film manufacturer offers high-quality eye-catching flexographic and rotogravure printing capabilities on its state-of-the-art printers. UPPC in Jeddah, Saudi Arabia, prints sophisticated designs at ease, with control systems, procedures and equipment that ensure consistent high print-quality, from the first till the last meter of the roll. Manufacturers and retailers look for the same result when searching for packaging solutions: an appealing, aesthetically pleasing package that attracts consumers, while providing the necessary functional properties of protecting, preserving, and storing the product. Mono-layer PE film is subject to high technical requirements, thus developing the film requires years of experience, high-tech machinery, adequate labs and test methods. United Plastic Products Company manufactures mono-layer co-extruded detergent film, as thin as 38 microns. 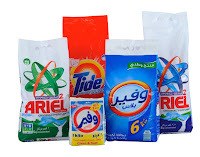 This film converts at very high-speed Form-Fill-Seal (FFS) machines to produce low-weight detergent pouches for low purchasing power markets. The manufacturer’s mono-layer film exhibits mechanical properties that are engineered to ensure conversion requirements at high speed, as well as product integrity and extended shelf life. Following years of experience and close collaboration with raw material and machine suppliers, UPPC meets high technology requirements for producing PE laminated detergent film, such as high puncture resistance, hot tack resistance and high gloss. UPPC PE co-extruded structured base film is solvent-less laminated to PE, polyethylene terephthalate (PET) or oriented polypropylene (OPP) on state-of-the-art-machinery. The high gloss PE-laminate converts at high-speed FFS machines to produce heavy-weight detergent bags.